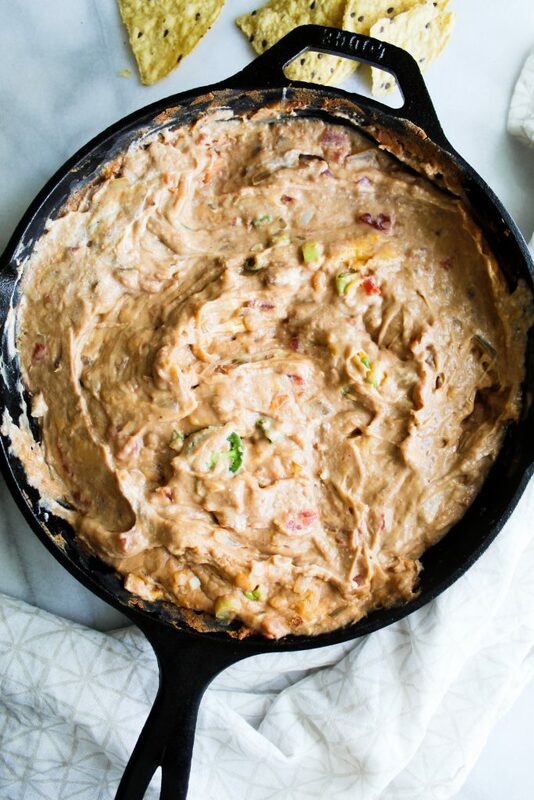 This Easy Skillet Refried Bean Dip is made with only 6 ingredients! It’s ultra creamy, decadent, has the perfect amount of spice and is great for a large crowd! Best part? It’s made in one skillet! I love beans. They are such a nutritional powerhouse! Yes, to all of you low-carb lovers out there – they make pack on the carbs. But they have an amazing amount of fiber + protein to make up for it! Seriously, I have no bias when it comes to beans. I’ll eat garbanzo, pinto, chili, black beans…the list could go on. However, I do have some extra love in my heart for refried beans. I know that technically they’re just pureed beans. But they have such a luxurious texture to them. They’re extra creamy but somehow light. They’re perfect to add on tacos (especially these tacos!) because they almost act as a glue to hold everything on the tortilla. Yes, I take my tacos extra seriously. 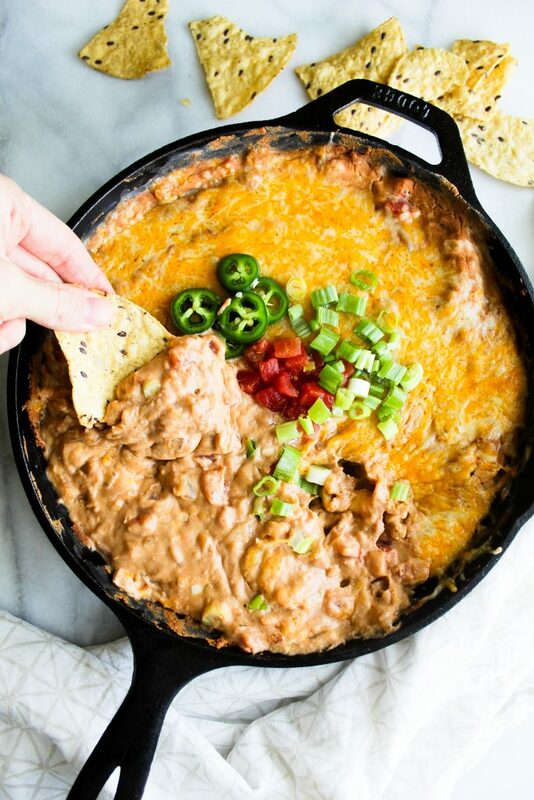 This easy skillet refried bean dip has everything you could possibly want! 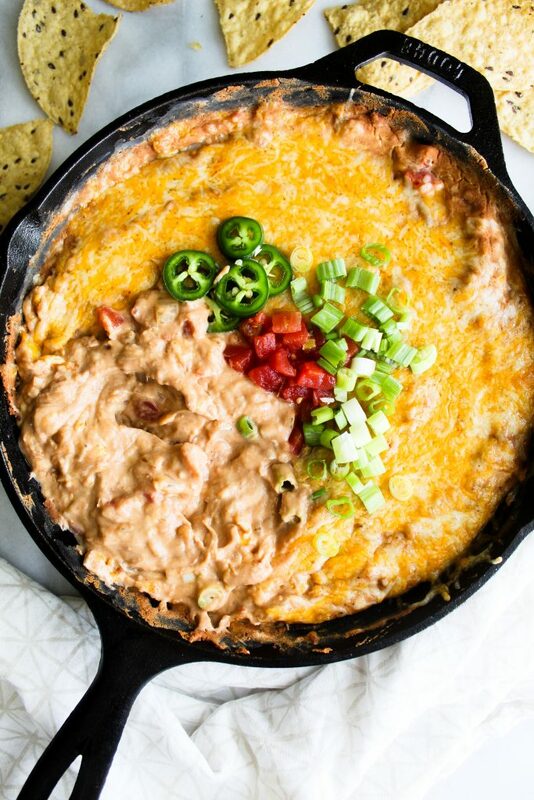 Combined, these ingredients literally will make you want to eat your weight in this bean dip. Or like, make it a hot tub like these tortilla chips did. 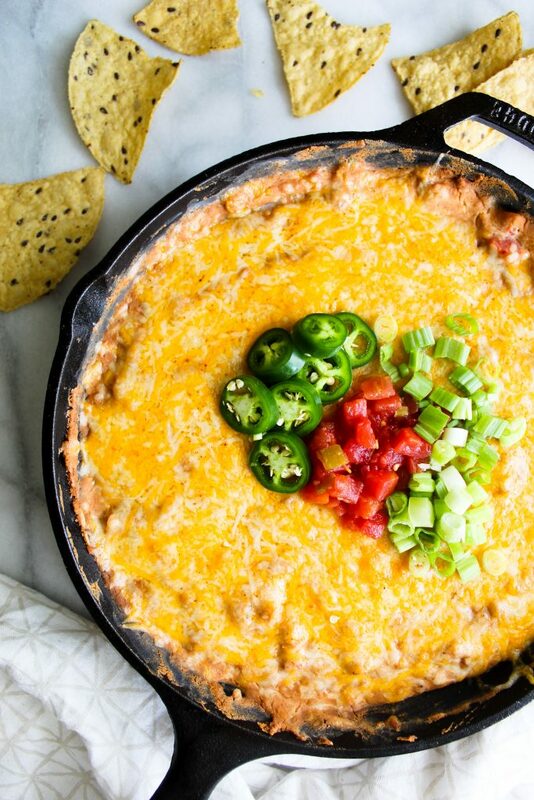 Bean dip hot tub for the win! 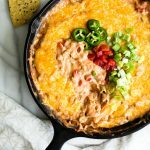 It’s creamy, a little bit spicy, it’s gooey with cheese, rich and it has sour cream swirled throughout. Dice a large yellow onion and three cloves of garlic. Add the onion into your cast iron skillet with a dash of olive oil. Cook for 2-3 minutes, or until the onions begin to be transparent. Add in your garlic, and all of those good spices like cayenne, chili powder, cumin and salt and pepper. Combine the ingredients and cook for an additional 1-2 minutes. Next, the star of the show: refried beans. Turn the heat down to low-medium and add in two cans to the skillet and mix everything together to combine it well. You don’t exactly want to cook the beans, simply warm them. Once they’ve warmed on the stove for a few moments, take them off of the heat completely. Here is where all the add-ins start to get extra lux. 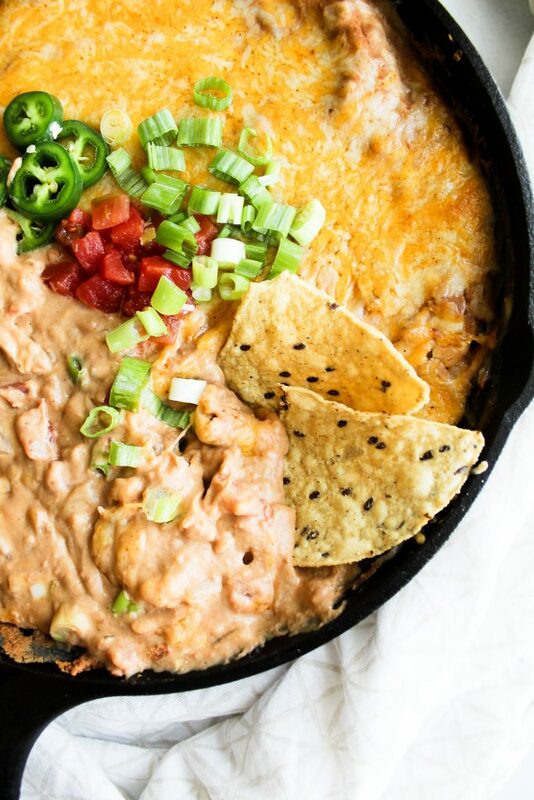 Add in a can of rotel (aka diced tomatoes and green chiles), a spicy blend of shredded cheese, and one of my all time favorite toppings: sour cream. The sour cream gives it so much richess and creaminess but adds a slight tang that is unmistakable. Mix it all together. Top with extra cheese because y’all, we don’t care about calories in this meal, okay?! Pop it in your oven to melt the cheese and everything together for about 5 minutes. To make sure the cheese is extra bubbly and golden, I even placed it on broil and watched it like a hawk for 2-3 minutes. AND THAT’S IT. Sit back, grab your favorite bag of tortilla chips and you’re set for the evening. Can I use any type of refried bean? You can use any type you’d like. I especially love the Black Refried Beans from Trader Joe’s. They have added jalapeños in them! However, I made this one with regular pinto refried beans to keep that classic taste. Anything you’d like! I added mine onto tacos, I ate it with tortilla chips, on top of tostadas. You could cut up some bell pepper for a low carb vibe. Or, you could eat it straight out of the skillet with a spoon like I did. It’s that good. Yes! We had ours in the fridge for about 5 days afterward in a sealed Pyrex container and it kept amazingly well! Tasted super fresh when we ate it for leftovers. 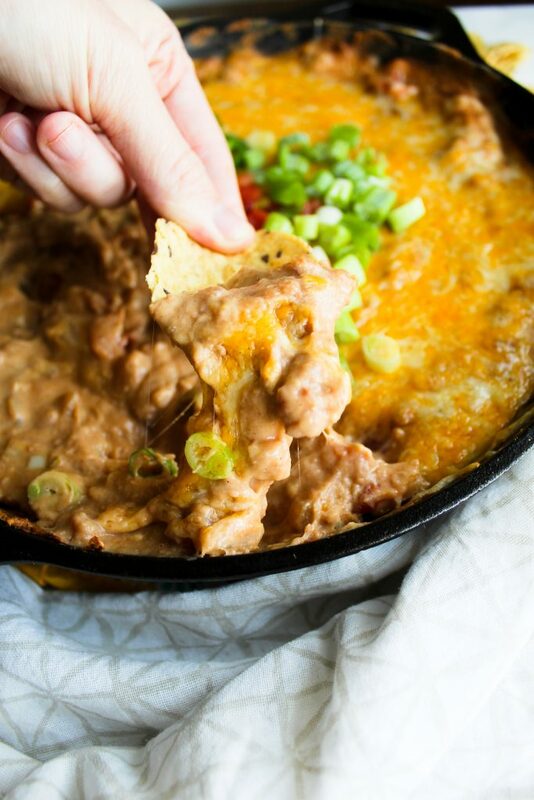 Try out this extra amazingly creamy delicious and EASY dip for your next party! I promise it will be a hit. Preheat oven to 350 degrees. Dice the yellow onion and mince the garlic. Heat your cast iron skillet with a dash of olive oil on medium heat. Add in the onion. Cook for 3-4 minutes or until translucent. Add in your garlic and cumin, chili powder, cayenne and salt and pepper. Mix to combine and cook for an additional 1-2 minutes. Turn the heat down to low-medium. Add in the 2 cans of refried beans to the skillet. Combine all of the ingredients well and let the beans heat through fully. Once heated through, take the skillet off the heat. Add in your sour cream, 1/2 cup cheese, and 1/2 can of Rotel. Mix to combine. Top with the remaining 1/2 cup of cheese. Place in oven for 3-5 minutes or until the cheese is golden and bubbly. If you need to, you can place it on broil for 2-3 minutes for additional color. Watch carefully though! Garnish with jalapeños, green onions and the remaining Rotel if desired. Eat immediately with chips, on tacos or by the spoonful! Enjoy. 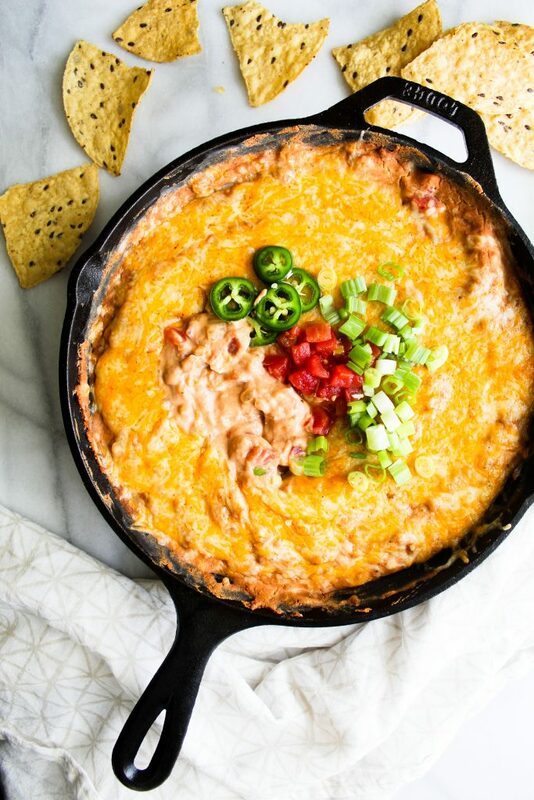 Rotel is a popular brand of canned diced tomatoes with green chiles. I so love this! I brought it to my mom’s house and the whole family devoured it. That’s awesome, Sarah! Glad your family loved it! Delish! I love anything that is easy clean up. Thanks for sharing! Easy clean up is the way to go! Thanks for the comment, Karly!